FMT Productions and Stagecoach proudly present this wonderful evening full of beautiful songs and dance from musicals, film and TV, for all the family, performed by the largest childrens choir in Malta. A fabulous opportunity for our Stagecoach students to show off their talents and raise some money for charity. 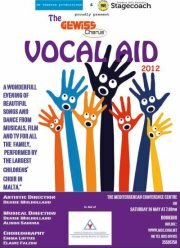 This year it is in aid of the Maltese Diabetes Association. Artistic Direction - Denise Mulholland.